Fair warning: People for whom I have great respect have suggested that this essay is better suited to a sporting magazine than Cereflections. But it has been over a year since anything new has shown up on the blog. Call it a dry spell, writer’s block, or sloth; the spell needs breaking and this effort aligns with a basic belief that there is much to be gained from thinking below the surface of mundane activities. Apology – In this essay, the word “fisherman” is not intended to be sexist. There are plenty of women who love to fish and are excellent at it. “Fishermen” is used in a purely gender-neutral sense rather than fishermenandwomen” or “fisherpeople” simply out of convention. It is intended to mean all people who fish. You can learn a lot filleting a fish. Yesterday a flock of raucous gulls telegraphed the arrival of a school of Morone saxatilis and one member mistook a blue and white plastic surface plug for breakfast. You’d think she would have known better. Based on her thirty inch length she had run this gauntlet at least ten times before and should have come to recognize the vast majority of lures dragged across her path by fishermen as she moved north in the spring and south in the fall along the rocky glaciated shores between the Chesapeake Bay and Labrador. A fish can be either skinned or scaled. The latter occurs before any cuts are made and takes advantage of the fact that scales are carefully arranged to overlap like shingles, with the unattached edge pointing tailwards. This makes sense aquadynamically for the fish and lets the scaler, while securing the fish with one hand, draw the back of a stiff knife headwards, popping off a snowstorm of scales along the way. These snowflakes look like simple miniature shingles until the fish slips out of the butcher’s hand leaving it covered with a handful of slippery slime. The first reaction is often “yuck” but on second thought it raises a couple of questions. Where does that mucus covering the scales come from? Does it do anything besides annoy the fisherman? It turns out that each scale is not an inert slab but rather a flat piece of fingernail-like material sandwiched between very thin layers of living skin which is loaded with the same kind of tissue which produce slippery surfaces in………us……. lining the insides of our mouths, our GI tracts and the other slippery slidey parts of our anatomies. That mucus covering of fish is created in situ from the surface of each scale. And it serves many purposes. A slippery fish arrows through the water with less friction than an unslippery one, expending less energy getting from here to there. Also, It turns out that there are lots of tiny things swimming around in most fish’s environments aiming to settle on a fish and do all sorts of damage. But since the mucus layer of a fish is constantly being washed off and replaced as the fish swims along, many of those would-be pathogens and parasites trying to hitch a ride are simply sloughed off along with the surface layer before they can wreak any havoc. And on top of that, chemical analysis of the mucus reveals a protective soup of antibodies and natural antibiotics! With luck, before many species are driven to extinction by ocean warming, we’ll be extracting powerful new weapons against human pathogens from fish mucus! One can think of “fish” in one of two ways. Either it’s that delicious and presumably healthful thing on our plate or it’s that whole creature driving bait to the surface, dangling at the end of a fishing line or swimming around in an aquarium. And if you think about that whole fish’s parts, they include a tail, some fins, a head, some innards and the rest – and it’s “the rest” which ends up on your plate in the form of fillets. Except for an occasional annoying fishbone, those fillets are pure muscle. In the majority of fish, fillets are mostly white but there is often a bit of darker muscle too. The darker red muscles are used for constant, relatively unenergetic exercise like holding position in stiller water. The white muscle is specialized for strenuous activity that require lots of energy fast. That bass launched at the lure from some fast-moving chaotic surf and wasn’t kidding when she came out of the water and hit the lure with force: all that white muscle in action. As many cartoons involving garbage illustrate, a fish skeleton involves a central backbone with backwards-slanted fishbones protruding in a single plane from its vertebrae. The filleter’s job is to separate the muscle cleanly from those bones using a sort of sharp knife – “sort of” because razor sharpness risks slicing through the bones, leaving them in the fillet, while a dull knife makes the job exceedingly difficult and risks wasting large amounts of flesh. The process starts at the uppermost part of the fish and involves running the knife edge between the bones and their attached muscle while lifting up the separating flesh. This process, done well, makes two things about fish anatomy clear. Each fillet, if it is peeled off those slanted fishbones, can be seen to be a series of parallel segments, and each of those segments is devoted to one of those slanted fishbones. So when that fish blasted through the surf towards what it thought was breakfast those high speed white muscle segments were contracting in a carefully orchestrated fashion to create a powerful back and forth undulation propelling the fish lureward. Once the fillets are off it becomes clear that for striped bass, the head occupies about a third of the animal. If we were built like that our chins would be just above our navels. But on closer look (at the fish) that comparison is not bad because the head really extends backwards to include the gills, and the gills, after all, are the fish’s lungs – and our lungs would be in our heads if our chins were down around our navels! The similarity doesn’t stop there because right between their two gills, tucked under the nape of the fish’s neck (if there is such a thing) is the fish’s heart – like ours – located between the two structures that extract oxygen from whichever medium the fish or we have evolved to survive in. Under the gill covers – those flat hard semicircles at the back end of a fish’s head – lie parallel rows of hundreds of delicate red finger-like projections. 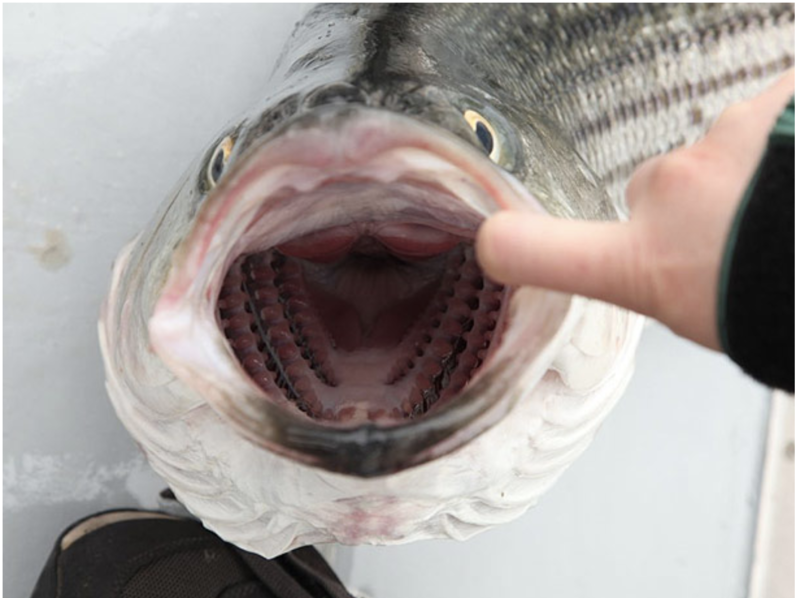 Looking into the fish’s mouth makes it clear that between each row of these gills is a linear gap through which water can pass as the fish moves forward. Predatory fish typically pursue their prey by lunging through the water, mouth open like the leading edge of a fishing trawler’s net. What rushes in is split into two parts. Water and the small particles suspended in it are sent out over the gills to be drained of its dissolved oxygen in the process. Before entering the gills, however, it must pass through a set of coarse boney fingers called gill rakers which deflect larger material down its gullet: a nice arrangement if you are hoping to catch your dinner while charging through the water with your mouth open. In fact, you never have to stop eating to breathe! But once you crawl up on land and don’t catch your food by rushing around with your mouth open, a lengthy commonality between food and air passageways is nothing but an accident waiting to happen. Nonetheless, in most mammals the route food takes as we eat shares, for several inches, the route air takes as we breath. Considering the number of “cafe coronaries” (adult sudden death from food suddenly lodged in the airway), and the number of childhood choking fatalities (an incidence of 0.66/100,000) one wonders why the slow grind of evolution hasn’t fixed that Darwinian handicap. Seagoing mammals with blowholes, however, are way ahead of us. In whales and dolphins, the airway is completely separated from the esophagus; no deaths from choking for them. So maybe all that speculation about their brains also being more advanced than ours isn’t so far off. Of course, there is a tradeoff – cetaceans are unable to breath through their mouths. But whoever heard of a whale with a stuffy nose? But back to the task at hand. Most good fishermen after they have filletted their catch, take a look at what it had been eating. Tucked along the fish’s belly right behind its chin is a cavity containing the animal’s visceral organs – among them its liver, gonads, and digestive tract. The stomach is easily identified as a muscular pouch which often is bulging with the creature’s last meal. Opening it can be revealing. Sometimes its emptiness gives a hint that the creature was hungry enough to take a chance on an iffy looking meal. But since striped bass are notoriously unpicky eaters their stomach contents are often more interesting. Sadly, an occasional plastic straw or tampon applicator comes tumbling out but more typically the stomach contains all sorts of prey fish like menhaden, silversides and herring, as well as crabs, shrimp, mussels, baby lobsters and squid. The more curious fishermen take a closer look and make sure their next lure bears some resemblance to what the fish have been feeding on that day. Tucked neatly into the same cavity as the fish’s stomach are its gonads. Since female bass are larger than males of the same age, most keepers are female and the one that fell for that blue and white piece of plastic was no exception. Just inside her belly two glistening golden, structures bulged with next springs eggs. Most fishermen feel a twinge of remorse on looking at all these future trophies – leading many to advocate for what is called a “split” size limit – restricting keeper bass to those between, say, 24 and 30 inches. This would allow more wise old “cows” to lay their huge clutches of millions upon millions of eggs, making for more young fish per clutch and possibly selecting for more challenging ones. Striped bass prefer rocky shorelines and one of the commonest places to clean a fish is right on the shore using a boulder as a work table. By the time the task is wrapping up the fisherman has typically attracted an audience of those same gulls which had earlier telegraphed the fish’s presence. Now, as if expecting payoff for their betrayal, they eye the process hopefully. In the event of carelessness on the part of the butcher – a trip to the water’s edge to rinse hands for example – they are not above pulling a double cross and lifting a fillet or two from the pan in which they lay. More experienced butchers know better than to turn their backs, however, and may even disappoint the audience by taking everything that remains home for stock. A more common finale, though, is to send the fish’s head back into the sea for the crabs to dine on and toss toss chunks of viscera to the waiting avian audience, underscoring the fact that we humans are just one more step in a great ecological loop. In a reflective moment I asked a close friend why we so loved to hunt and fish. “It’s just anachronistic,” he said, as though that explained it. Both of us relish our time out of doors – away from cement, asphalt, glass and steel – and especially those priceless moments of intimacy with a fellow creature not of the human race. The partridge bursting from brush beneath our feet. The hare zigzagging away at full speed. And not just during hunting or fishing seasons. The school of bluefish brushing our legs as we swim in the surf also thrills. He’d rather row the boat while I cast, provided I hand him the rod every other time a fish is hooked. Once on the line, we are connected to that other being, that beautiful product of evolution, or design – whatever. And the connection is as intangible as it is material. The fish has beaten the odds – floating as a defenseless egg on a hostile sea, schooling as a fingerling, evading sharks and gillnets for years in adulthood. It has plumbed dark depths, migrated in response to mysterious forces, felt the draw of mates. It has a will, to survive. We feel it directly in each jump and run. We too have a will, however redundant or anachronistic, to bring it home to feed ourselves and our families in a way so much richer, at least to us, than the finest meal at the finest four star. And in so doing the fish becomes us, at least in a materialistic sense. The fact that its will does not brings us face to face with the Great Mystery, though our perhaps-wiser forebears thought it did. Bringing home a piece of plastic-wrapped chicken from the supermarket has none of that. Eating it, we sustain ourselves with a nearly synthetic product of our civilized economy. Hens bred with breasts so huge that their legs give out, raised in warehouses with manufactured food delivered by conveyor, mass slaughtered with Henry Ford stainless technology, quick chilled, aseptically wrapped, transported, presented with Madison Avenue-designed aesthetic. Is that what we become? Let me gut my fish barehanded on a rock and toss its roe to the hungering gulls, knowing that in doing so I have sacrificed some of the next generation of bass. Let me keep fresh in my mind the will that fueled its jumps and runs, and wonder if that spirit is now no more or has instead returned to some larger source from which it was simply borrowed or shared. Let me ask if my own will may not come from and eventually return to a similar source or maybe the same. Meanwhile, all those ineffable drives and desires and even thoughts are translated into concrete action by the sparkling synaptic machinery laid out by our DNA. Anachronistic, yes, but there’s more to it than that.